Who says actuaries are boring? Actuarial Jokes, Memoirs and Other Minutiae will convince otherwise. 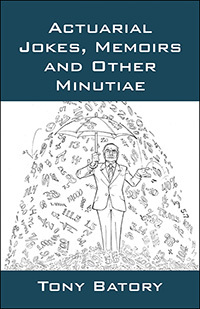 Tony has assembled a collection of anecdotes that find the humorous side to being an actuary. No profession may be more grounded in reality than being an actuary. That just makes actuaries fodder for an incredible collection of jokes. The anecdotes take turns being funny, irreverent, angry, thought-provoking and educational. Actuarial science may never be the same. Tony Batory M.S 1978, F.S.A 1981, M.A.A.A 1984 has had a 35 year career as an actuary mostly in group health insurance. Tony’s customers ranged from large mega-corporations to the smallest groups. His actuarial work covered business, academic and political aspects. Tony also plays bass guitar in several jazz and rock bands.